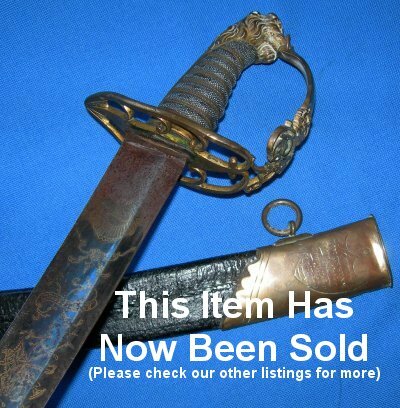 A rare, treasured, 1803 pattern British infantry officer's sword, marked with the figure of a Grenadier Guard, in very good condition for age but with clear battle damage. An exceptional sword. Etched both sides all the way down the blade, very good blue and gilt sections remaining, the figure of a guardsman with his plume on the left of his bearskin (Grenadier Guards), special length for a flank officer (which is how the Grenadier Guards fought), period nicks to the forward cutting edge of the blade, some slight period / very old damaged to the hilt. 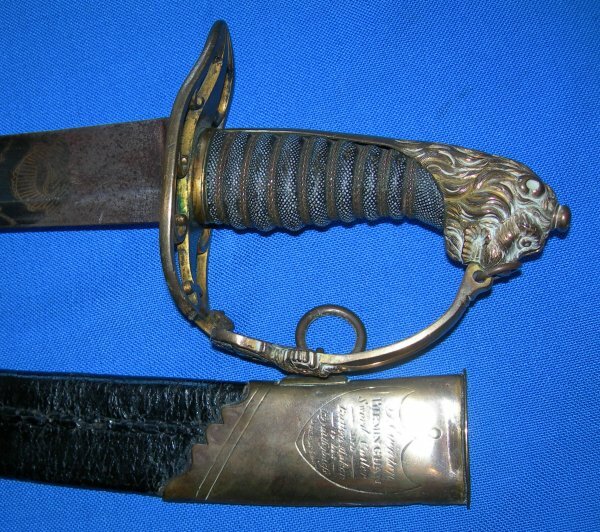 This sword clearly was closely involved in the Napoleonic wars, most likely at Waterloo. The 30 1/4 inch blade is clearly for a flank officer, and is superbly made, with the normal blue and gilt etching extended with standard etching all the way down to the point section. Within the blue and gilt are the guardsman figure, British Royal Coat of Arms, Royal Cypher, "Warranted" and maker's name "Eginton", further down Britannia and cannons etc. on one side, the female figure of Victory on the other. Several period nicks to the forward cutting edge. Some fading to the ricasso / forte. Blade firm in the hilt, the hilt generally good but for a small missing section to the royal cypher section of the guard, clearly very old if not period damage. The fishskin grip with twisted grip wire bindings in very good condition. The scabbard aged but complete, the top locket bearing the inscription "J Eginton Birmingham Sword Cutler and Button Makers to his Royal Highness the Duke of Kent (King George III's fourth son, Prince Edward Augustus)"
It rarely gets better than this. So the price is a bargain, tremendous investment and about the most evocative purchase you can make. Please quote item reference F60 (890). Further / full sized images available upon request.